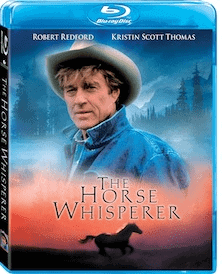 In 1998, Robert Redford starred in and directed The Horse Whisperer; now celebrating its 15 year anniversary, it became available on Blu-ray July 3rd, 2012 for the first time. Adapted from the bestselling novel by Richard Evans, The Horse Whisperer features beautiful cinematography, a romantic musical score, and a moving story that tugs at heartstrings. Kristin Scott Thomas stars as Annie McLean, a busy working mother whose daughter Grace (Scarlett Johansson) and beloved horse were involved in a traumatizing accident that left Grace crippled and the horse in critical condition. Annie refuses to have the horse put down because of how much it would affect her already suffering daughter, and vows to find a way to rehabilitate the horse. After sifting through horse publications, Annie learns about Tom Booker (Robert Redford), a man who lives in Montana who works with horses and is called a “horse whisperer”. She calls him from New York and asks for help, but he refuses to consider it. Desperate to help both her daughter and the horse, she packs up Grace and the horse and drives out to Booker’s Montana ranch. I had been hesitant to watch The Horse Whisperer because I am really sensitive about animal films, and I suspected that it would probably make me cry bucket loads of tears. But since this is Robert Redford we’re talking about, I decided I would take that chance with tissues on hand. The opening scenes of the film as well as a few in the middle were a bit difficult to watch, but I clenched my fists, gritted my teeth, and made it through. I was surprised by how much of the film did not even revolve around the horse; about halfway through, the focus shifts to the relationships between Annie and Tom, Grace and Annie, Grace and Tom, etc. Annie and Tom get to know each other on a more personal level, and I wish that this had not even happened. What little we know of Annie’s family is that they are pretty disconnected; Annie works all of the time and doesn’t seem to have much of a strong bond with either her husband or her daughter. Finally, Annie’s husband arrives from New York, and she has to make a decision on what direction she wants to go: does she go back to New York, or stay in Montana and lose her husband and her daughter? The Horse Whisperer is a beautiful movie that managed to keep my interest through the entire 3 hours. I’d have preferred a different ending, but it may have just followed the story telling of Nick Evans, who wrote the novel on which this film was based. I enjoyed the movie so much that I’ve decided I want to try reading the novel to get more insight on Tom Booker and Annie McLean. I did not receive any financial compensation for this review, though I did receive a sample of this product for evaluation purposes. The opinions are based on my experience with the product.